Koh Phi Phi is considered to be one of the most naturally beautiful islands in the world. 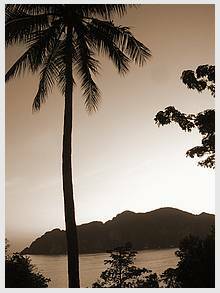 Relax on Laem Thong Beach – Koh Phi Phi got what the everyday lives not have. The islands are known for its fantastic landscapes with the magic beaches and steep rock formations towering more than 300 meters over the ocean. Nature lovers find a paradise in the crystal clear warm waters and the many coral reefs which makes a colorful maritime environment. Enjoin long strolls along the beaches. Rent a long-tailed boat and go snorkeling and visit the neighboring islands. The 1970 backpackers made the island famous with the beach life and laid back atmosphere. Phi Phi Islands has preserved its charm and natural beauty, but now known around the globe as the ultimate paradise island. 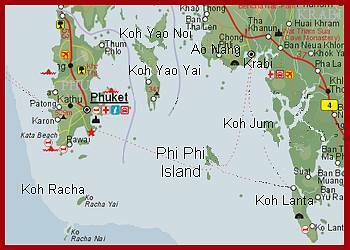 Koh PP can be reached from Phuket, Krabi, AoNang and Koh Lanta. Book with no misunderstandings. 15 years experience in Thailand. Incl. land transfer AoNang area. Land transport can be arranged. 01APR – 19OCT not sailing. 20OCT-15NOV Period - Departure only on even dates from Koh Lipe / odd dates from Koh Lanta. 16NOV-31MAR Period – All departures carry out daily. Phi Phi on Tonsai Pier / Koh Lanta on Saladan Pier / Koh Ngai at Koh Ngai Fantacy Resort / Koh Mook at Charlie Beach Resort / Koh Buloan at Pansand Resort / Koh Lipe at Bu-Nga Resort, Pattaya Beach. Price does not include longtailboat from speedboat to your resort. Incl. Two way transfer from hotel in Kata, Karon and Patong Beach. Transfers from other areas + surcharge. The passenger boat also serves as a ferry. After ferry passengers are set ashore on Tonsai pier – the ship anchor up on a coral reef for snorkeling. SPECIALS! ONLY FOR BOOKINGS MINIMUM 30 DAYS UPFRONT. Arrive Phuket Town and transportation back to the hotel. Snorkel & Mask incl. Book - Plan your Thailand holiday with the experts. 07:00 – 16:00 Sightseeing - snorkelling - lunch. English speaking guide. Speedboat with up to 4x 200HP - The hidden lagoons and beaches are visited. Program: Speedboat to Phi Phi Ley (45 min) - Maya Bay - Phi Leh Cave - Viking Cave - Speedboat to Phi Phi Don - Wang Long Bay - Lunch - Monkey Beach, where monkeys are fed - Nui Bay, Hin Klang (amazingly beautiful coral reef) - Khai Noi Island, relax & snorkelling - the tour includes: Tea/coffee, snacks, soft drinks/bottled water and fruit on board. Buffet lunch (Sea food, Thai & Western) snorkel, mask & life jackets, insurance. Incl. Two way transfer from hotel in Aonang. Other areas +surcharge. Depart from Ao Nang & Railey Beach - Arrive Phi Phi Don - Snorkelling Maya Bay (known from the movie "The Beach") - Cruise by vessel around Phi Phi Lay, Loh Sama Bay, Phi Leh Bay and Viking Cave. Lunch at Phi Phi Don and relax on the beach - 15:30 Departure from Phi Phi to Railey & Ao Nang. Arrive at Ao Nang and transport back to the hotel. Snorkel & Mask incl. 09:00 – 17:00 Sightseeing - snorkelling - lunch. English speaking guide. Program: Speedboat to Phi Phi Ley (45 min) - Maya Bay - Phi Leh Cave - Viking Cave - Speedboat to Phi Phi Don - Wang Long Bay snorkelling - Lunch - Monkey Beach, where monkeys are fed - Nui Bay, Hin Klang (amazingly beautiful coral reefs). - Tour includes: Tea/coffee, snacks, soft drinks/bottled water and fruit on board. Pick up on the beach at your resort. Speed ​​Boat Phi Phi Ley - Maya Bay - Phi Leh Cave - Viking Cave - Wang Long Bay - Lunch - Monkey Beach, where monkeys are fed - Nui Bay, Hin Klang (amazingly beautiful coral reefs) - The tour includes: Soft drinks / bottled water and fruit on board. Pick up on the beach at your resort. Speed ​​Boat Phi Phi Ley - Maya Bay - Phi Leh Cave - Viking Cave - Monkey Beach, where monkeys are fed - Tour includes: Soft drinks / bottled water and fruit on board. Less than 9 years without charge. Visit some of the landmarks and anchor up by good coral reefs. Start / Finish on Phi Phi islands.